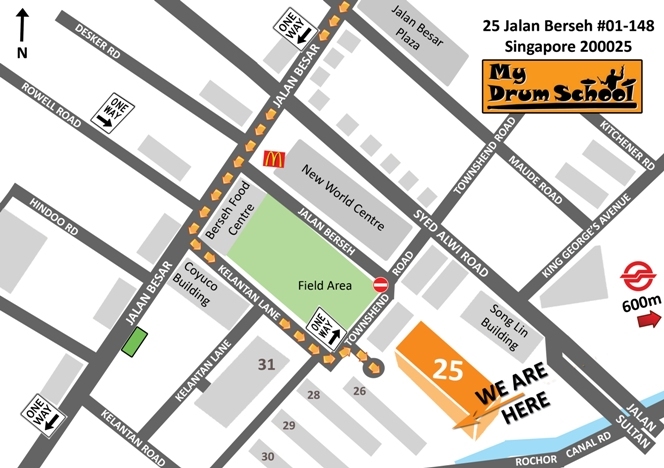 The route to take for drivers would be Jalan Besar > Kelantan Lane > Townshend Road. Enter by Kelantan Lane from Jalan Besar. It is the turn before Coyuco Building. Do not enter by Jalan Berseh. Keep left along Kelantan Lane and make a left turn into Townshend Road. After turning left, make an immediate Right Turn into a small roundabout lane. Drop off at the roundabout and take the Left Path. There are parking lots along Townshend Road. Walk along the corridor and My Drum School (Lavender) is at the end of the block. Unit #01-148.